Waste-Away Group : Trash...Burn It Or Bury It? In order to create a sustainable world for future generations, such issues as economic growth, food sources, population, and the management of waste must be addressed. Considering that the estimation of trash being generated by Americans each year reaches over 390 million tons, managing waste ranks toward the top of the list of environmental concerns. In the United States we recycle and compost about 94 million tons of that waste, or roughly 24 percent, but much more could be done. If we doubled our rate of recycling in the United States, we would still be burdened with hundreds of millions of tons of waste to find an environmentally friendly, energy efficient, sustainable solution for. We ultimately have two viable options: take waste to a landfill or an incinerator. The debates over incinerating garbage are never-ending. Proponents of trash incinerators boast their Waste-To-Energy (WTE) properties as well as pointing out that their emissions are lower then Environmental Protection Agency (EPA) standards. WTEs reduce the volume of trash by about 90 percent, leaving about 10 percent in the form of ash that still needs to be landfilled unless it can be used somewhere else. The question has been posed, "We Reduce, Reuse, and Recycle...then what? Where others would simply bury waste, we put it to good use by recovering reliable, renewable energy while meeting the most stringent pollution control requirements. Using this renewable energy source to power homes and businesses in the communities we serve offsets the need for fossil fuels. That means less mining, less drilling, and less reliance on foreign imports." For this group, a fourth "R" has been added, standing for energy Recovery. Enough energy is created by WTE plants to provide heat electricity to thousands of surrounding homes and businesses. So why are the opponents so, well.....opposed? Most of the people who are against WTE plants cite the following reasons to be toward the top of the list. First, it has been speculated that recycling efforts would drop dramatically because people would have a fallback to rely on with incineration and would no longer put forth the time and effort to recycle. Studies actually show the contrary. "The five European nations with the highest recycling rates — Germany, the Netherlands, Austria, Belgium and Sweden — also have among the highest WTE usage, to the point that they have reduced landfill use to less than 1 percent of their waste. Sweden even competes to import waste....it does not appear to have reduced their recycling effort, which is higher than that of the 22 other European nations. 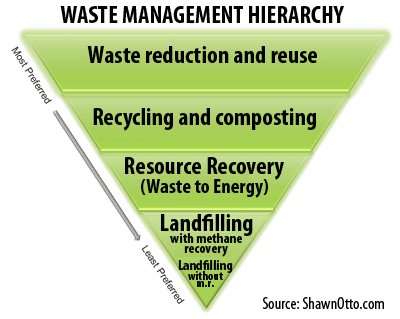 In America, by contrast, where environmental groups frequently portray the issue as an either/or choice between recycling and WTEs, both rates are much lower, and a whopping 69 percent of U.S. municipal solid waste winds up in landfills." The "Not-In-My-BackYard" (NIMBY) argument has been made, also. Although, some experts say that you would never know that there was an incinerator even close by. The residue remaining after the incineration process has also been said to be toxic, although proof of such is not apparent. The EPA developed a test called the Toxicity Characteristic Leaching Procedure that tests the ash with an acidic liquid. Over 40 contaminants are tested for. Scientists have tested ash from every WTE facility in the country over the course of several years, and the tests have consistently shown that the ash is non-hazardous. The ash residue from incinerators can be used as filler in asphalt or cement blocks, thus alleviating some of the need for raw materials in these processes, too. The benefits seem to outweigh the detriment when it comes to the most current information on incinerators and WTE plants. For more information on waste removal and options, visit www.wasteawaygroup.com.